Well, folks, I'm sorry I'm late with this but even after I tracked down the film I wanted, it took awhile to get to watching. It was one of those weeks. But now we finally have our first American Western Movie Of The Month, one from a director not all of you may be familiar with but have probably seen a film or two of his. Yes, folks. I bring you a review of..! Supercool Trivia: Obviously, has a bunch of siblings in it! Great Older Actors - CHECK! Awesome Ry Cooder Score - CHECK! Whores, Bar Fights, and Other "Outlaw Cliches" - CHECK! Fade To Black & White - CHECK! So, before we begin this, I suppose it's best we reintroduce ourselves or introduce the n00bs to a great director, one who may get some crap for some of the worser films he does, but who's consistent and great enough to deserve honorable mention - WALTER HILL. Director of such films as The Driver, The Warriors, 48 Hours, Trespass, Southern Comfort, Extreme Prejudice, Last Man Standing, Undisputed and...er...Supernova. >.> He's done a few more I'm either forgettin' or just not mentioning. (though seeking out Hard Times would be a good idea ) The thing that Walter Hill is really good at making - Peckinpah homage. Although some of his work has been original or influenced by others (John Woo, Kurosawa, Leone, etc.) there's usually a lot of Peckinpah in him, which is fitting given this guy helped co-write/adapt The Getaway. So when you start talking about Walter Hill making a western with a group of outlaws, well...you see where this is going. But the great thing about The Long Riders is as much as it does use Peckinpah, you can start to see the post-70s Western start to be revealed in this film, where the authenticity started getting...well, BETTER, I'll say since I guess there's factual errors about the people in this film, but the look and the production design was getting better. And the emphasis started moving from the desert of Spaghetti Westerns back into the more woodlandy areas, eventually going into things we see like Unforgiven and Open Range. So it's a cool piece of movie history as well, seeing the shift begin, and it helps deviate the film from what you may potentially expect. Which is really the crux of this review and this film - it's a different feeling western. "Why?" you may ask, well, I'll tell you - it combines the slower and more deliberate western with those Peckinpah-style bursts of blitzkrieg violence. Which, arguably, is what Sam did in the first place. But what I mean by thta is Sam had a gritty plotline that was typically based around the evil deeds men do and the efforts and uphill struggles of their lives (i.e. Bunch and Alfredo Garcia). 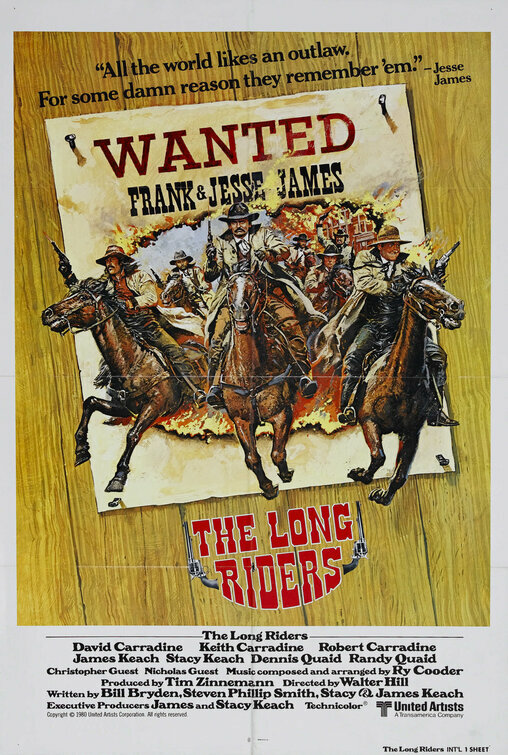 In The Long Riders, we see the James-Yunger gang at a position where they've become what they are and are sort of coping with their actions the best they can, not because the harshness traumatizes them, but more along the lines of what kind of repercussions their murder and robbing causes in their lives, leading to the unfortunate deaths of loved ones and the tension of having to seperate to different corners. See what I mean? Emotional core that's a bit more upfront. But hey, this is an action film too, right? Oh you bet it is. Although in the photos below I did have one shot from the huge final gunfight of the movie (though not the ending of the film, it goes on an extra 15-20 to get to the whole Ford Brothers thing), I tried to shy away from showing you what really, really makes this film. Although we have bursts of gunplay here and there (including a scene that heavily inspired The Devil's Rejects), the real build-up is to this big scene. Basically a recreation of the shoot-out from the beginning of The Wild Bunch, that's slightly slowed down so as to show us more of the thoroughly amazing stuntwork (and it is truly stunning) and give us a surrealistic/omnious arpproach that's not often seen in showdowns like this. Basically - Walter Hill reminds us of HOW IT'S DONE. Maybe not shows us directly but he sure as hell gives us a reminder. So there, we now have outlined the fact it's a dramatically interesting and at-times emotional film (if not directly) and the fact it's got some amazing action set-pieces. What else we got? Okay, let's get to the visuals and sounds. The great location scouting in this film is the kind that reminds you why we need to keep making Westerns in the United States. Canada is really close but it's just far away enough that you can tell. When you see the areas of Georgia used for this film, you'll love it. And the DP was able to get an amazing look on this film, that's basically what appears to be the proving grounds for Deadwood's interiors. Also of note, the greens of the gorgeous forests show up basically about as good as Boorman's Excalibur without using the green lighting that he did in Ireland - very cool stuff for the cinephiles. The film's cinematography overall is great, though. From the use of wide-angle lenses, magnificentally timed slowmotion, wide expanses, compositions that fill the screen with the characters, and the grimy look that populates it - it's a good looking movie to boot! And the sounds...okay, here's where I get personal here. I love Ry Cooder. If you've never heard the man, you've missed out. While characterized by his guitar work typically and his fusion work, the stuff Ry did for this film is great, not just because of it being well-made but also due to being well-made authentic music, trying as hard as can be to accurately depict the musical texture of the time period and culture, which goes along perfectly with the production design of costumes, sets, and props. It's a great score of twang, fiddling, and just the little hint of Wild Bunch military drums. If you dig the movie, you can also grab up the soundtrack and I highly suggest those of you who have an affection for this time period and Western films ought to. Altogether, the elements that make up this film are not always combined in the best way and I will say the editing is a bit too slow for my tastes at times, but I'm a different person from a different era - but what works, works really well. This is a film that hasn't dated as well as other Walter Hill films, or other westerns, but it's a film that is worthy of its invention and definitely worthy of credit - especially given how forgotten it is nowadays. I know I didn't speak of performances, story, etc. I won't here because I'm taking awhile to just write all this out and also because I feel that's something that's a lot more subjective than the rest of the film. What I speak of here can't be argued or debated much - but the story, historical accuracies of characters, and acting...that can be debated a bit more. But the last note I will say - the fact James Keach hasn't gotten more roles is criminal after his amazing turn as Jesse James. Accurate or not - truly grand performance. Last edited by EvilFutsin on Wed May 07, 2008 1:09 pm, edited 2 times in total. I saw this film a long, long time ago. I remember I enjoyed it but that's about it. Time for me to rent this sucka again! Nice write up there dude. Just like Red, I saw this movie a long time ago. But there are indeed some intersting things in the write up. And actually, I like the non-contents style ... I will see the contents anyways, once I watch it. This way I have some background and extras. Red - You must rent it and bring it forth that we may watch it! =Chico= wrote: Red - You must rent it and bring it forth that we may watch it! Once I'm able to make the drive, you can bet on it. Be scouting for some good restaurants. I'll want a hearty meal & a couple of cold ones before the flick. Well, fellers, pair of questions. First of all, Red and Chico, you get ahold of this film yet? Curious to know whatcha think. Secondly, it's a new month and I'm not sure what to go with. I'm kinda tempted to do a film that's Western-Inspired (like Serenity, Devil's Rejects, or The Getaway), but, the catch is I really haven't shown y'all enough classics yet. =P So classic-wise, it may be The Hunting Party (old-school but seriously nasty) or The Great Silence (durh, Corbucci). Expect one of those two to be it in a couple of days. I'm afraid Chico & I haven't been able to get together for this flick yet. In addition to my dirtbike injuries (which still aren't healed) I'm nursing a new eye injury as well. Just ain't my summer so far. As for which flick to do next, I have no vote from your list. I'm afraid my repertoire doesn't quite compare. You do a great service here so review anything you like. If it's requests yer after, let us know.